Helen Scaife is the kind of woman you point out to your kids. “Look at her,” you’d say. “She realized that she couldn’t do much without a high school diploma and went back to school when she was 56 years old.” I first met Helen Scaife about seven years ago. 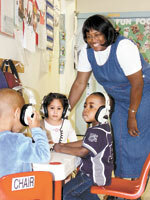 Her home business had just become the first accredited African-American day care in the state. She was a basic education student at Agape Community Learning Center. Having dropped out of school in 1956 after completing 8th grade, Helen felt bad that she didn’t have a diploma. We sat on the floor as she worked with a two-year-old child, showing him colors and matching shapes on a puzzle board. I could see that she loved to work with kids and was good at it. My own stereotyping kept me from seeing Helen’s potential as a business woman. This is when you say to your kid, “She used the talents she was given. Worked hard, put the money back into the business. Bought a building.” Scaife Day Care Center, 531 E. Burleigh St., has an enrollment of about 80 children ages six weeks to 12 years and offers first and second shift care, as well as pick up and drop off services. The building was formerly owned by the East Side Housing Corporation (ESHAC), a now defunct neighborhood nonprofit. It needed extensive renovation, including adding child-sized restroom facilities, turning two garages into classrooms, adding a kitchen, and making it child safe. Now you give the financial literacy lecture about the importance of establishing a relationship with a bank and keeping your credit record clean. Helen had saved nearly enough to buy the building, but not to renovate. She went to her bank. “I had favor with a banker. I met with him — and mind you, I didn’t have my GED at that time.” They offered her $25,000, but that wasn’t enough. “I stayed with the same bank and kept communicating with them. They gave me this young man. He and I connected. I told him my story– where I came from, and what I had done, and about my education. We connected like a mother and son.” She started the renovation and about halfway through, got the full loan of $300,000. “I had never had access to that kind of money. I’m excited now.” Here’s a place for another parent lecture. “See, she realizes the customer is always right. She communicates. She knows how to get along with people.” Helen has the same challenge running a business as most people–it is difficult to get good workers. “Workers that I would say have day care at heart. You don’t find that too often.” Customer service is also a problem. “A lot of times young people are not really people people. When they don’t treat the customer right, I need to go and put a band aid on that wound and get the customer back.” After years of attending classes at Agape and MATC, Helen finally got her high school diploma through Waukesha Technical College. WTC offers a diploma that measures real-life skills instead of test scores. All of her business experience certainly shows Helen has skills. The high school diploma means so much to her that she offered to pay two of her workers for four hours a week while they attended classes. One has already completed her assessment. Helen sees herself as a role model and teacher for the young women she employs. “Everything I know, I try to teach them.” Employees can also opt into a 401K retirement plan, although Helen says few of them do because they are young and don’t see that far ahead. Helen believes in planning for the future. “I don’t pay myself much,” she whispers. Having been divorced with five children, she knows how to budget. She also knows that her best investment is in her children. One of her daughters works fulltime as the business manager; the other four, who are employed elsewhere fulltime, help out when they can. At the age when most people are ready to retire, Helen Scaife is building a dynasty in day care. Slots are available at Scaife Day Care. Call 414/456-2027. The second floor meeting room at Scaife Day Care is available for a rate of $25 an hour to community groups. Newly renovated, the room accommodates about 100 people and has tables, restrooms, and a separate entrance.